Gretna Green is one of the world's most popular wedding destinations, hosting over 5000 weddings each year, and one in every six Scottish weddings. Gretna Green's famous "runaway marriages" began in 1753 when Lord Hardwicke's Marriage Act was passed in England. The Act stated that if both parties to a marriage were not at least 21 years old, then parents had to consent to the marriage. This Act did not apply in Scotland, where it was possible for boys to marry at 14 and girls at 12 years old with or without parental consent. Many elopers fled England, and the first Scottish village they encountered was Gretna Green. 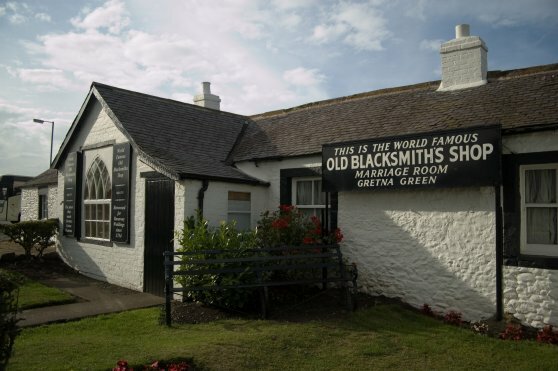 The Old Blacksmith's Shop, built around 1712, and Gretna Hall Blacksmith's Shop (1710) became, in popular folklore at least, the focal tourist points for the marriage trade. The Old Blacksmith's opened to the public as a visitor attraction as early as 1887.